We should be able to get a species ID on this now. Anyone want to give it a shot? I see that, besides two stumps-for-legs on the left side, this beetle has a congenital perforation of its right elytra. 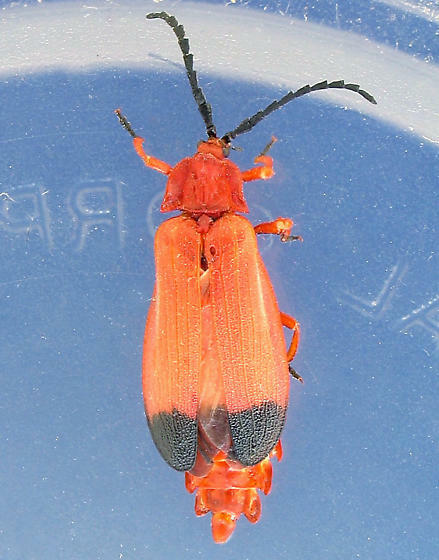 I think this is Lycus sanguineus. They are pretty common on streams in Arizona. I found a female this weekend with a really swollen abdomen. It probably was full of eggs. Thanks, but I need more info. When someone offers an ID, it is useful if they are able to comment authoritatively, such as a credentialed coleopterist or collector who knows what traits distinguish the species in question from other possibilities. Barring this, it is still useful if the offered ID can be used to find Internet images that agree with the image in question. In this case, I found no other images of that species on the Web. This places the image contributor in an awkward position, since they want to expess gratitude for the ID but want to be accurate as well. Sorry to burden you with all this explanation. Hopefully you or someone will be able to set my mind at ease on this ID. But till then, I'll leave it at genus level. sp. is listed from NM and image (not great for ID purposes) can be found here. L. sanguineus is listed in the BISON species list for New Mexico, including the Organ Mountains.